The hunt was on today for a penguin that scaled a sheer rock face to escape from a Tokyo zoo and was last seen swimming in a river in the Japanese capital. 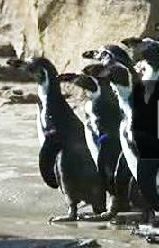 Echoing the hit animated movie Madagascar, the one-year-old Humboldt Penguin fled over a wall that was more than twice his height, and later was seen bathing in the mouth of a nearby river. Officals are trying to track down the penguin and return it to the zoo.